It’s been cold and rainy the last few days which has me reaching for cozy staples to weather the dreary temps. Last Thursday, it was snowing. You read right. SNOWING!!!! As much I want to wear brights and pastels for spring - it’s just not gonna happen in this miserable weather. So instead I decided to go earthy, and combine some of my favorite muted colors. I mean, who says olive and coral is just for fall anyway? BTW, I'm loooving this tee! It’s super soft and adds just the right amount of color when paired with this f21 utility jacket. I've been really impressed with the few Lucky Brand tops I've purchased so far. I'm definitely going to look into getting some more. For now, I’m just hoping and praying warmer weather is headed our way. Because I don’t know how much of this I, (or my hair) can take! Love the colors! The color of the top is super gorgeous and I love the detailing as well! Awesome choices mixed together! Great look Jenny! 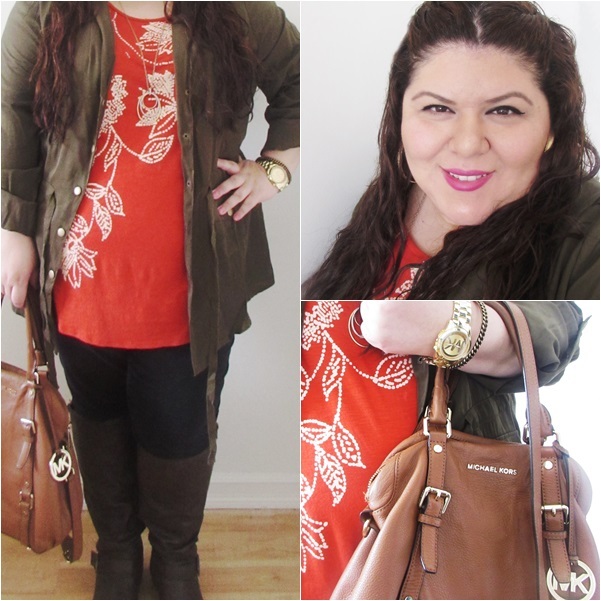 Love that utility jacket and the color of that top is gorgeous!